Rural migrants’ earnings disadvantages are largely attributable to occupational segregation based on workers’ hukou status, and the pattern of occupational segregation varies by employment sector. Rural migrants who work in governmental agencies or state institutions earn less than their urban counterparts, whereas those who work in public or private enterprises earn higher hourly wages. Policies and public efforts should be made to reduce occupational segregation and remove other structural barriers, and to enhance the education and further training of rural migrants, to help them gain equal access to a variety of occupations in urban China’s labor market. The economic reform in China since 1978 has not only brought phenomenal growth and prosperity, but has also unleashed dynamic forces that previously had been suppressed. The increase in the number of migrants without local household registration status (hukou) reflects fundamental social and demographic changes in Chinese society since the 1990s. Although geographic mobility and employment change have become relatively easier than before, a sizable percentage of migrants continue to be denied the rights and benefits of citizenship simply because they do not have a local hukou. Among all economic disadvantages faced by rural migrants, the earnings disparities between this group and urban local workers have received much attention from scholars and policy makers. While scholars have typically linked rural migrants’ earnings disadvantages to their lack of a local hukou in cities, they have not reached a consensus on how hukou status affects earnings inequality between rural migrants and urban residents. 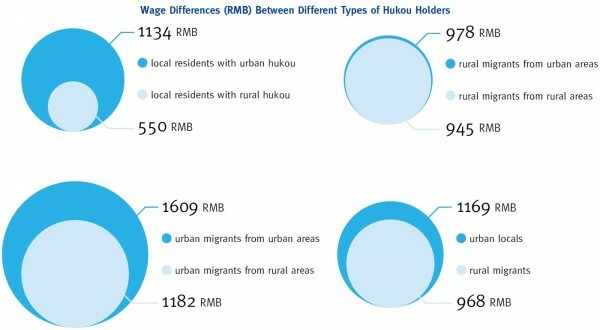 Some scholars argue that, rural migrants are paid less mainly because they have poor productivity-related attributes while other researchers have suggested that the stigma of being without a local hukou may lead to unequal pay for rural migrants in urban labor markets, even though they hold similar jobs to urban workers. Hence, the mechanisms of how hukou status affects earnings inequality between rural migrants and urban workers are portrayed in different ways. The first mechanism can be referred to as the “segregation effect”, where hukou status plays an indirect role and workers are sorted into different occupations and sectors based on their hukou status and other characteristics. The other mechanism can be referred to as the “discrimination effect.” In other words, employers tend to reward workers within the same occupation based on their hukou status, and the lack of an urban hukou status is the direct cause of rural migrants’ earnings disadvantages in urban labor markets. Using data from a nationally representative survey, we explicitly examine how occupations moderate the link between hukou status and earnings differentials between rural migrants and local urban workers in China. Specifically, we aim to identify through which mechanism — occupational segregation or unequal pay— the hukou system generates earnings inequality in China’s urban labor markets by decomposing the earnings gap into two components—a between-occupation component and a within-occupation component, and comparing their relative contributions to the overall earnings inequality. We also directly examine the effect of hukou status on the earnings attainment of rural migrants by employing a matching methodology which compares rural migrants and urban locals with similar characteristics. The 2005 one-percent population survey, conducted by the National Bureau of Statistics of China, is by far the most suitable data to investigate the questions above. The survey collected information on respondents’ earnings, employment status, type of work unit, working hours and fringe benefits, in addition to hukou status, place of hukou registration, current place of residence, education and other demographic characteristics. We restrict our sample to the 119,675 adults aged between 16 and 60 who were residing in cities and towns at the time of survey for our analysis. As the central interest of this study is to investigate earnings disparities between rural migrants and urban residents, we define the key independent variable based on hukou registration status, the place of registration, and the place of residence. The graphs above illustrate the earnings differentials among the six groups defined: the average monthly earnings of local residents with a rural hukou were 550 yuan, only half of the earnings of local residents with an urban hukou (1,134 yuan); rural migrants from rural and urban areas earned 945 and 978 yuan per month, respectively, whereas the corresponding figures for urban migrants were 1,182 and 1,609 yuan, respectively. The results from group comparisons suggest that hukou status mattered more than where the migrants originated from in determining their earnings in urban labor markets. Our descriptive statistics show that rural migrants were disadvantaged in many observed characteristics pertaining to earnings. On average, urban locals earned 1,169 yuan per month but rural migrants earned 968 yuan per month, 17 percent less than urban locals. The gap would be even more substantial if we take into account the fact that rural migrants worked 10 hours longer per week than urban locals, with much less benefits. Table 1 shows that the earnings gap also varied across different work units: rural migrants earned 36 percent less than urban locals in governmental agencies/state institutions, 13 percent less in public enterprises and 8 percent less in private enterprises. Our multivariate regression analysis reveals that, even after controlling for the effects of gender, marital status, education, age and its squared term, rural migrants still earned 11.2 percent less than urban workers. After occupation (managers, professionals, clerks, sales and service workers, and manual workers), employment status (employer, employee, self-employed), and working hours are added to the equation, the earnings gap decreases to 7.4 percent, but continues to be statistically significant. When we further include work unit type, the gap decreases to 5.3 percent. These results suggest that the observed earnings differential between rural migrants and urban workers cannot be completely explained by their differences in personal characteristics. The results from regression models suggest occupational segregation to be an important mechanism in creating the overall earnings inequality between rural migrants and urban locals. To demonstrate this empirically, we employ a decomposition method to disentangle within- and between-occupation earnings disparities between the two groups. The analysis indicates that urban workers earned about 12 percent more (=e0.117-1) than rural migrants, which is made up of the within-occupation earnings gap (-0.083) and the between-occupation earnings gap (0.200). The negative within-occupation differential suggests that rural migrants indeed earned more than urban workers within the same occupation, while the positive between-occupation differential indicates that urban workers earned more because on average they had occupations with higher pay. The occupational segregation effect more than offsets rural migrants’ advantages in within-occupational pay, leading to rural migrants’ overall earnings disadvantage relative to urban workers. Furthermore, occupational segregation was highly related to rural migrants’ disadvantages in observed characteristics, such as education, gender, marital status, and age. The decomposition results suggest that, on the one hand, occupational segregation was the main source of migrants’ earnings disadvantages relative to urban local workers, and on the other hand, such restrictive access to occupations with higher pay can be explained mainly by the migrants’ observable characteristics. 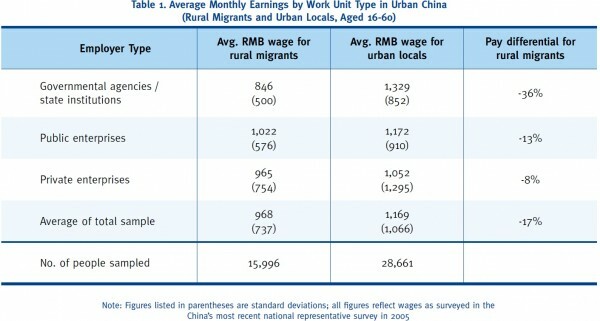 Then did the rural migrant status have a causal effect on earnings in urban China? To address this issue explicitly, we conduct a propensity score matching analysis. Our analysis demonstrates that the average treatment effect is positive and statistically significant in the full sample, suggesting that rural migrants indeed earned 0.43 yuan per hour more than urban workers on average compared to those without rural hukous who have similar individual and job characteristics. The difference can be interpreted as the causal effect of rural hukou (migrant) status on earnings per hour. By removing more bias attributable to observable characteristics other than occupation, the propensity score matching analysis provides even stronger evidence to the claim that rural migrants’ overall disadvantages were caused by occupational structural barriers, rather than by the employers’ discrimination against them in urban labor markets. Our findings carry important implications for policies tackling the problems related to rural migrants’ socioeconomic inclusion in Chinese cities. Because unequal pay for rural migrants within occupations seems to play a minimum role in generating earnings inequality between rural migrants and urban workers, policies and public efforts should be made to reduce occupational segregation and remove other structural barriers, to help rural migrants gain equal access to a variety of occupations, especially well-paying ones, in China’s urban labor market. To further facilitate the reform of China’s household registration system, the State Council of China issued the Regulations on Residence Certification on December 4, 2014, clearly stipulating that all new employment, education, and skills training policies must not be linked to one’s hukou, and migrants in county-level cities could apply for a local residence certificate. To what extent the majority of migrants are eligible for local residence certificates and equal treatment, and how such policy changes would affect the patterns of occupational segregation and economic disparities between migrants and local workers, remains to be investigated. Xiaogang Wu is Professor of Social Science and the Director of the Center for Applied Social and Economic Research at HKUST. He has written extensively on China’s social stratification, economic transition, educational inequality, class, gender, ethnic relations, labor migration, and subjective wellbeing. He is currently the Principle Investigator of “Hong Kong Panel Study of Social Dynamics”(2009-2014), and also is working on a longitudinal survey of college students in Beijing since 2009. Zhuoni Zhang is Assistant Professor in the Department of Applied Social Sciences at City University of Hong Kong. Her research interests include social stratification and mobility, migration and immigration, labor market, income inequality, and education in both Hong Kong and mainland China. She is currently working on a research project, “Neighborhood Characteristics, Parental Practices and Immigrant Children’s Academic Performance and Non-Cognitive Skills in Hong Kong”, funded by the Early Career Scheme from Hong Kong Research Grant Council.